Each vehicle holds six people, including an attendant who’ll have the ability to fully control the shuttle at any time to ensure safety. The state’s news release provides more information, although not much more detail. Oddly, that includes the expression of concerns from the bus drivers’ union, which isn’t the sort of content one generally gets from a promotional government statement. Each of these shuttles will be too small even to carry two three-person families, because one-sixth of its capacity will be taken up (essentially) by a driver who isn’t driving. This might be why we don’t tend to allot our cutting-edge work to government. Wasn’t there anything else on which the state could spend half a million dollars it shook down from Volkswagen? Broadly, Rhode Island is relying too heavily on debt to cover its bills. The Mercatus Center at George Mason University puts Rhode Island’s long-term liabilities at 90% of the state’s assets, which is higher than the average state. Truth in Accounting’s State Data Lab gives Rhode Island a D for finances, with $8,288,881,000 in bonds and other liabilities, plus another $4,316,527,000 in pension and other retirement liabilities. A recent Rhode Island Public Expenditures Council (RIPEC) report finds Rhode Island already among the worst states when it comes to debt per capita and debt per income. More debt is not the answer to the Ocean State’s problems; it is a major problem in itself. Adding $589,462,045 in principal and interest by passing the three ballot questions will make it worse. The State of Rhode Island and its municipalities must be more prudent with the tax dollars they already collect — for example, prioritizing school-building maintenance over more frivolous projects. This is another area where the public needs more education on the issues and all too few people have any incentive to provide it. A crucial addition to Dan McGowan’s metaphor for lapsing school repairs. For my weekly call-in on John DePetro’s WNRI 1380 AM/95.1 FM show, this week, about the politics of bridge traffic and the competitiveness of primaries and Providence mayorality. To speed things up, the RIDOT already plans to work around the clock, toiling through the night, which adds to a project’s cost but makes the work go faster. For some reason, the most important point for us to discuss as a community in response to these government failings never seems to come up. If we were to lighten up on the ridiculous labor rules that make the cost of roadwork so high, project managers would gain all kinds of flexibility. That’s a side effect whenever the price of something goes down. Drop the cost of construction 25–40% (or more), and the state and municipalities will find it easier to keep roads and bridges well kept so they don’t get to the point of needing major repairs as quickly. Working around the clock or only when traffic is light would more-often be an option. If the cost were lower, we might have the slack in maintenance budgets to (in some instances) build entire alternate routes while the main route is entirely shut down. When insider deals and corruption eat up budgets to the maximum that people will tolerate for the minimum tolerable output, there is no room for spending on strategies that make Rhode Islanders’ lives better in the midst of construction. The transportation sector is a reflection of the goods-based economy in the US. Demand has been blistering across all modes of transportation. Freight shipment volume (not pricing… we’ll get to pricing in a moment) by truck, rail, air, and barge, according to the Cass Freight Index jumped 10.6% in July compared to a year earlier. This pushed the index, which is not seasonally adjusted, to its highest level for July since 2007. The dynamics in the transportation sector are “clearly signaling that the US economy, at least for now, is ignoring all of the angst coming out of Washington D.C. about the trade wars,” the report by Cass said. Things are just easier when the economy is strong… even bad government. How about we end the day with some conspicuous fairness? So… that 24/7 Wall Street index showing Rhode Island with the worst roads and bridges in the country. The bottom line is that this result can’t really be pinned on our current governor, Democrat Gina Raimondo. Yes, one could point out that the data appears to be from 2015 and 2016, during which time she was in office, but that was early in her term, and she was working on RhodeWorks. Yes, one could suggest that her program’s emphasis on increasing revenue means that RhodeWorks goes in the wrong direction and that the introduction of tolls makes it a net negative, or even a potential disaster, but that’s outside the scope of this index. More importantly, that very view of RhodeWorks illustrates the long-term predicament into which our state has allowed itself to sink, beginning well before Gina Raimondo was a public figure. The money we pay into government for things like maintaining infrastructure doesn’t actually go to those things, and nobody currently in office (who is able to do much) challenges the insider game that draws the funds away. Earlier today, Gary Sasse tweeted the observation that it’s “hard to improve road conditions regardless of money if road builder, RIDOT, union axis is not addressed.” One can only reply (as I did) that this axis is the one thing in Rhode Island that can never be challenged, because it is the essence of the state. It shouldn’t be the essence, though, and it should be challenged. That’s where criticism of Raimondo would be fair, especially to the extent that people supported her based on the promise that pension reform was only the beginning of her reform of the insider system (as insufficient as it was). Roads and bridges are a long-running problem, in our state, but placing ambition over real reform is Raimondo’s own betrayal. Rhode Island Trucking Association’s complaint about a bureaucrat’s regular use of air time to promote a gubernatorial candidate points to our problematic campaign finance system. How’re the Tolls Doing So Far? As Larry Gillheeney and Monique Chartier have both already noted, the American Trucking Association has filed a lawsuit against Rhode Island for uniquely targeting its members (and other interstate truck drivers) with tolls. With this topic in mind the Ocean State Current contacted the Rhode Island Department of Transportation (RIDOT) to check in on how the tolls are performing, thus far. According to a spokesperson, the available numbers are still rough, in part because they are awaiting verification from the truckers’ home states. They are also only available for the three weeks from June 11 through June 30. During that period, RIDOT reports 133,000 toll transactions. The spokesperson said the original projection was around 7,300 per day on weekdays and “about half that” on weekends, which would suggest that the actual numbers are beating the projections by about 5,000 tolls during that period. Of course, two considerations come into play, at this point. The first is that these were the very first three weeks of tolling, so any truckers who might decide to reroute in the future may not have adjusted their behavior, yet. The second is that the tolls’ hitting their projected targets isn’t but so significant, given that the fully implemented program will have seven times as many tolls, creating more incentive to divert away from them, and that the judiciary might rule RhodeWorks unconstitutional, as currently structured. 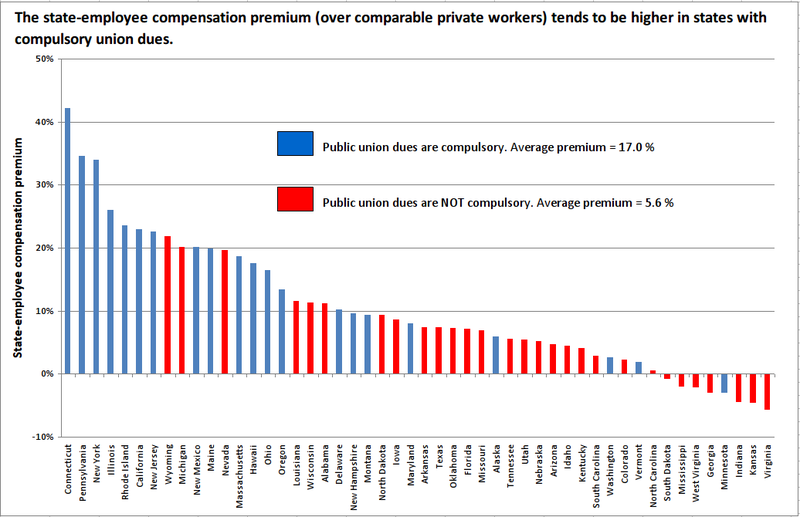 … there is indeed a correlation between compulsory union dues and public-sector compensation. Based on data from the report that Andrew and I wrote in 2014, state workers in compulsory states were paid 17.0 percent more on average than comparable private workers, while state workers in non-compulsory states were paid just 5.6 percent more. How much more economic activity would we be experiencing if it weren’t for this premium taxed out of our economy, and how much more work could we get done on government services and maintenance if it weren’t so expensive? Its common knowledge that parts of Michigan are falling apart. One reason for the disintegration of infrastructure within Michigan is a jobs-killing union rule that drives up the cost of government projects. This puts many necessary repairs and upgrades outside the reach of State’s budget. Finally, this budget-killing rule has been thrown in the trash by the state legislature. Wednesday, June 6th the Michigan House of Representatives and Senate passed a measure to put an end to the budget-killing union rule called the “prevailing wage.” This rule required that all construction projects initiated by the state government to pay workers the same wage union members make, even if the workers hired for said projects are not members of a union. Rhode Island’s infrastructure maintenance budget would go so much farther (and require much less debt) if the government would allow itself to pay market rate for the work. Unfortunately, when it comes to our state government, we’re not a pragmatic state, but one concerned mainly with keeping insider arrangements alive. Readers in the Rhode Island area, particularly to the east of Providence, may have caught wind of the heavy traffic along I-195, yesterday. Apparently, crews were repairing some sort of “depression” in the road, perhaps from a prior patch. These things happen, of course, but the longer a fix takes, the more traffic it causes, and the more expensive it is to do road work and maintenance, the less state and local governments will be able to do. To be fair, the reporter does say that the video was being taken as the crew was doing “finishing touches,” so at earlier periods the ratio of people working to standing around might not have been two to eight, as appears to be the case in this short clip. That said, seeing high proportions of watchers to workers is hardly an unusual experience in Rhode Island. That crew could easily have been cut nearly in half without a loss in efficiency or safety simply by putting the cone placers to work setting curbs and giving the supervisor a more-active task. I never did road work when I was in construction, but similar tasks would probably have called for only three people: One helping to set the curbs, one operating the machine, and one going back and forth to hook the machine to each new curb piece. Multiply that excessive labor cost times every task associated with every yard of roadway, and the potential savings that could be put toward accelerated repairs and maintenance or left in the private economy would be massive. Eliminating any presumed need for truck tolls would just be the starting point. Regular readers know I put a lot of emphasis on incentives as a way to understand events and a key consideration when crafting policies. The $250 million school bond proposed for the November ballot is a good example. On the front end, the incentive is very strong for school districts and municipalities to let facilities deteriorate. First, the law is structured to give advantages to labor unions organized at the state and even federal level, creating incentive for them to manipulate the political structure. Then, elected officials have incentive to tilt budgets toward organized labor, drawing money to compensation. Next, having learned from that experience over time, taxpayers have incentive to squeeze money out of budgets so that even higher taxes aren’t paying again for things like maintenance that they thought were already included and that might be diverted again if available. The organization lists its address as 410 South Main St., the same building as the Laborer’s International Union of North America. Haslehurst said it will share space with the Occupational and Environmental Health Center of Rhode Island, a nonprofit that has an office inside the building. A quick look at the health center’s IRS filing shows that it’s a labor union organization, with AFL-CIO poobah George Nee as the treasurer. ‘Round and ’round the incentives go, to the point that running things efficiently — in the way people run their households, planning ahead and all that — seems almost to be an impossible task. Be skeptical of anybody who tells you that this is a “once in a generation” investment that fixes a problem. After all, when the debt payments subside, the incentive will be to find more projects in need of debt or to build the payment amount into regular budgets. A bond. A scoop. a bond. A scoop.